Utah Beach – the wrong beach! Due to strong tidal currents, the allies landed approximately 2kms off course. This error proved to work in the favour of the Americans as German resistance was considerably weaker in this part of the coastal defences. The landing at the Utah landing points were considered an almost perfect success as the Americans suffered very little casualties (less than 200 killed); in complete contrast to the horrific losses on Omaha Beach. Once the beach head was secured, it was used as a port to unload hundreds of thousands of men and approximately 800,000 tonnes of equipment. The land between our house and the sand dunes of Utah Beach was utilised as a make shift prisoner of war camp to hold captured German soldiers until their deportation to England. 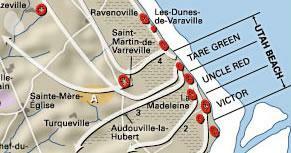 Our property stands directly behind the area of the allied landings in the village of La Madeleine. Brigadier General Theodore Roosevelt Jr., assistant commander of the 4th Infantry Division and his men landed in this area before making their way further in land. 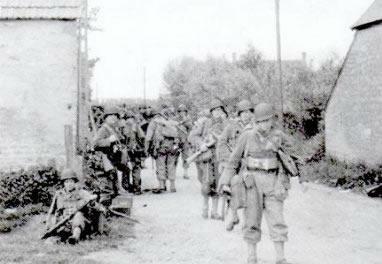 In the background of this photo, you can see the twin chimneys of our farmhouse; American soldiers passing it on their way towards Sainte Marie Du Mont and Carentan. All these years since the invasion, Utah Beach attracts thousands of tourists; the month of June is especially busy due to the D-Day celebrations. On the 6th June 2001, Tom Hanks, the cast of Band of Brothers and the veterans of Easy Company came here for the world premiere of the hit television series. The area welcomed these important visitors and there were a number of events to pay tribute to the brave men of the Airbourne Divisions. A special ceremony was organised at the war memorial. 2014 marks the 70th anniversary of the D-Day battle for Normandy and there will be numerous events to celebrate this momentus day. For the 65th anniversary, Barrack Obama came to Normandy to pay his respects to the achievements of those great men who lost their lives on the five beaches that fateful day. The remaining World War 2 veterans still visit the D-Day landing sites and the many parachute drop zones in this area. Over the years, some veterans have chosen to stay with us and this has been a real honour for us. 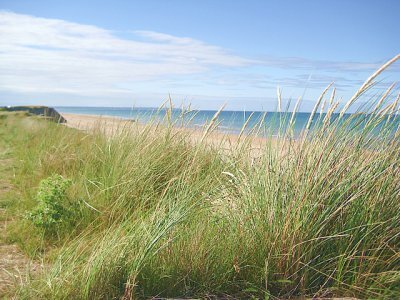 Our location is perfect for exploring the D-Day beaches as well as the many beautiful areas in the magnificent part of Normandy. For those who plan to come to Normandy for the D-Day commerations, we strongly advise you book early. Most B&B’s and gite rentals are booked well in advance. Our bed and breakfast and self catering gites can be booked securely online. A hastle free way to start your vacations in this wonderful part of France. A week in one of our gites starts from as little as 300 euros so there has never been a better time to visit France.